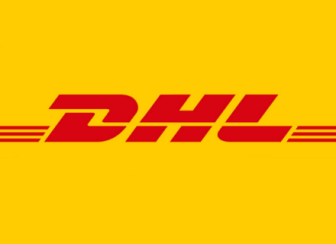 As a vivid online shopper, do you always receive the 'sorry note' from courier company when you are not at home, which you have to go and collect the parcel from the pick-up center? Now, we have a new service in town which might lessen your trouble - the parcel lockers! 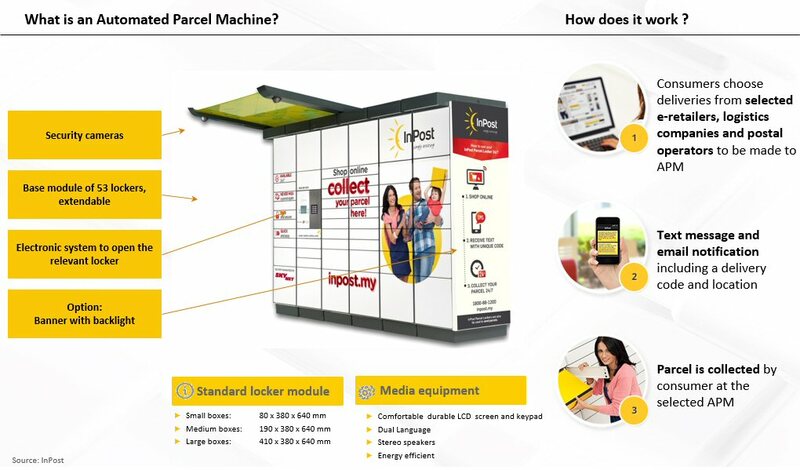 InPost, the world largest parcel lockers network worker and operator is now in Malaysia, with 30 lockers have already been deployed in Klang Valley since June 2015, targeting 140 lockers in Klang Valley within 2016 and 350 lockers nationwide in 2017. Special offer to eCommerceMILO readers: Free InPost Parcel Locker rental service for Aug 2015 + 20% discount for the first 3 months! First 100 only, register here! Where are the lockers located? They are now available at selected locations like Petronas petrol stations, Tesco hypermarkets, TAR University College (Genting Klang) and LRT stations. Below is a closer look on the parcel locker. What are the benefits for online shoppers? In contrast to pick-up centres by courier companies, parcel lockers are available everyday 24/7, so customers can collect their parcels out of the working hours. Imagine students in the colleges and universities, where parcels are usually delivered to the admin office instead of individual hostel. Parcel lockers will be able to provide convenience and privacy for students to shop confidently (and freely) online. Since parcels are aggregated and delivered to the parcel locker locations, online shoppers can expect cheaper delivery option at the same time speedier delivery. If you buy something that you don't want anyone else to know, parcel lockers can be your preferred option as we can cite the famous Vegas quote, 'what's bought online stays in parcel lockers'. Collection is fast and secured too, picking up a parcel takes just 7 seconds and you just need a text message, a few clicks or a QR code scan - and the locker opens! Still not sure how it works? You can view the video below or try a web demo here. If you can't view the video above, click here to view on YouTube. What are the benefits for online merchants? Similar with cash on delivery, adding another delivery option like parcel locker will not only provide convenience to your customers, but also allow you the opportunity to penetrate untapped customers. Think about the students in the college, working professionals, mobile workers etc., all of them are potential parcel locker users. According to a research done by InPost in Australia, 41% of InPost parcel lockers customers tend to shop more often after using parcel lockers. 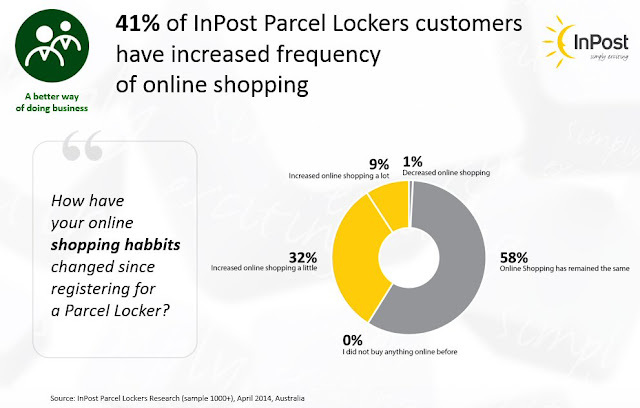 To be more specific on how parcel lockers can boost e-commerce, we have to first look at why customers refrain themselves from shopping online. We can't deny that delivery is one of the biggest concerns of shoppers before placing online orders, as they might be worried about the additional cost, delivery timeframe and risk of failed delivery. A research done in UK has just proved that 56% of customers refrain from shopping online due to the fear of failed delivery. 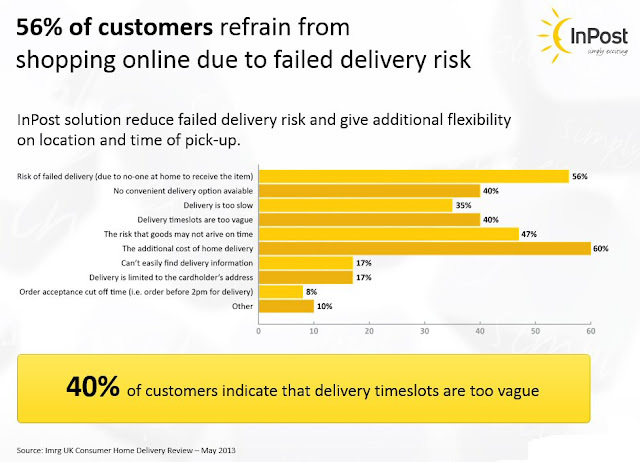 Failed delivery is mostly contributed by no-one at home to receive the item, where as in this part of the world there might be other contributing factors too. 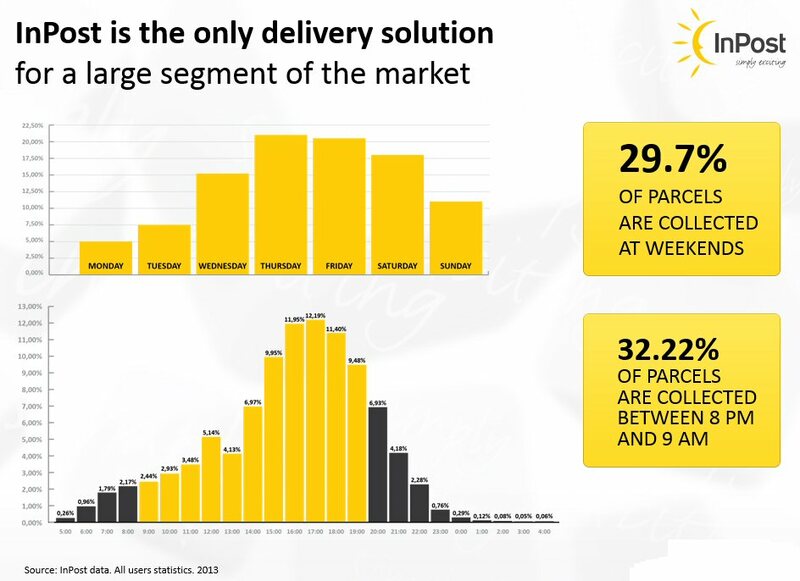 This is how parcel lockers offered by InPost can help mitigate the customer's delivery concern, starting with 98% of all parcels are delivered within 24 hours. According to InPost data, close to 30% parcels are collected during weekends, and 32% parcels are collected during night hours (8pm to 9am). Besides that, there are also other usage possibilities like reverse logistic (customer return to merchant via parcel locker), virtual address (privacy concerns and ordering from overseas websites), box to box and so on. You can also think of other applications on parcel lockers like new products sampling, loyalty point's redemption, warranty claims, spare parts delivery, refrigerated lockers and mini automated post replacement. InPost is also partnering with local banks towards a more secure and safer debit and credit card delivery and collection. Any important documents that requires proof of collection is also verifiable as receipt is provided to each intended recipient. How about specialised lockers for laundry? You can drop of your laundry at the parcel lockers (or laundry boxes to be exact) and pick-up the day after! In Malaysia, InPost is partnering with on-demand personal concierge service, Helpr to introduce laundry service via parcel lockers. 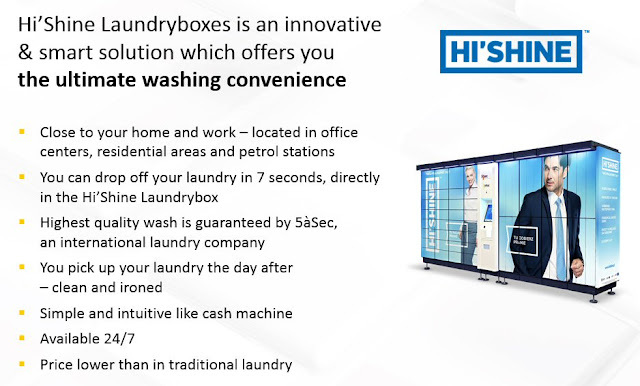 This would be a revolutionary concept for busy working professionals to get their laundry done by dropping off their garments / articles in any of the InPost parcel lockers. How it works? Customers just need to SMS to 019-3596194 and send in their laundry request. Helpr will confirm the availability of lockers and revert with locker's password and QR code to the customers so that they can drop off their laundry at designated locker. Upon completion, customers will receive the payment link from Helpr and they will be notified via SMS on the locker details to collect their cleaned laundry once they have completed the payment. 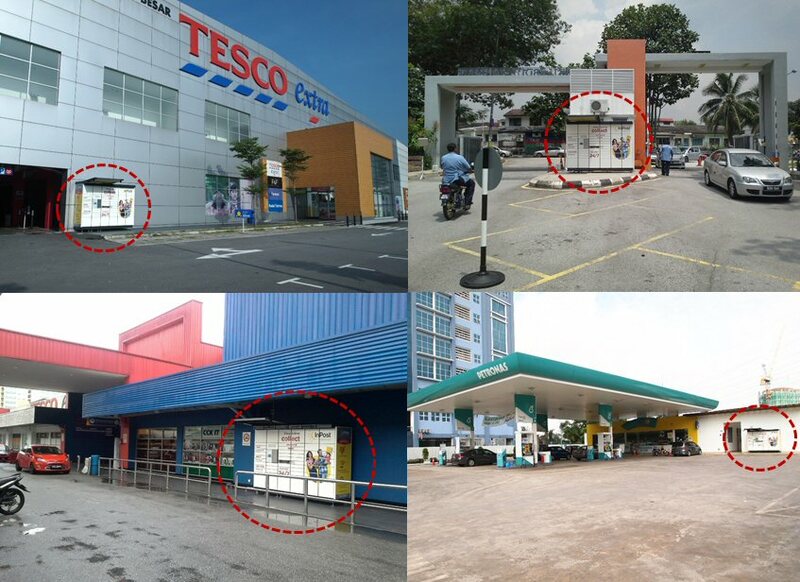 Such service will be available from 10th August 2015 at 5 locations: Tesco Puchong, Tesco Extra Shah Alam, Tesco Extra Ara Damansara, Petronas NKVE Toll Arah Damansara, and Tesco Extra Mutiara Damansara (first phase). Parcel locker is available 24/7 at customer's convenience and they can pick their cleaned laundry in 24 to 36 hours turnaround time. Limited-time introductory charges are: RM12 for small locker, RM24 for medium locker, and RM45 for large locker and it's based on all-you-can-fit basis. The service is available for normal wash and fold only. So the possibilities are endless, especially if you are brand owner! Special promo for eCommerceMILO readers! 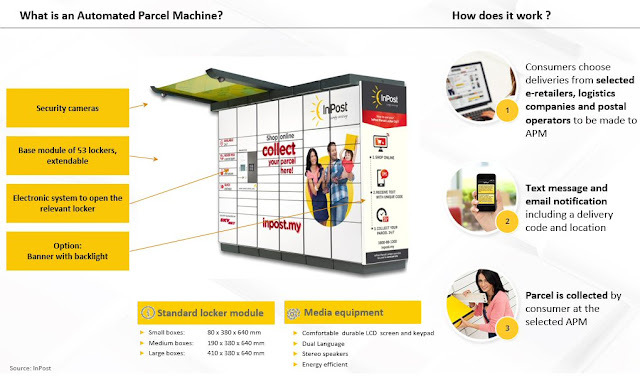 InPost is the only parcel lockers operator who has setup with some scale in Malaysia so far, with the plan of increasing the current 30 to 140 lockers as soon as next year. A total of 350 lockers is envisioned for nationwide deployment in major cities within 3 years' time. According to Rosland Mohd Jannes, Managing Director of InPost Malaysia, "We already completed the B2B integration with our designated delivery courier Skynet Worldwide (M) Sdn Bhd, so that the service is readily available to their clients via manual or automated integration with Web API". As an open platform, the choice for integration to offer the automated parcel locker is also available via istoreisend.com (iSIS) who are able to provide a full e-fulfilment services such as warehousing, picking and packing and delivery to the InPost parcel lockers. "We are providing geowidget to partners and merchants for geo-location of the parcel lockers (see below), and customer hotline 1-800-88-1200 has also been established for any queries and customer service", adds Rosland. Besides working with location partners, logistic partners and global partnership deal with a few global brands such as Avon, Rosland and InPost Malaysia is looking forward to partner with more e-tailers, MLM and marketing partners here. Online merchants who are already using webShaper e-commerce in a box solution will have InPost Parcel Locker readily available as built-in delivery option. If you are interested to explore more about InPost, there is no better timing than now as InPost Malaysia is offering Free Rental service until August 2015, and then 20% discount for the first 3 months, exclusive to eCommerceMILO readers! Sign-up here now, limited to first 100 merchants only!